What is a Request for Information under RESPA? 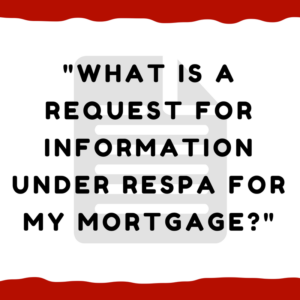 What is a request for information under RESPA for my mortgage? RESPA is the federal law that governs mortgages. If you think your mortgage company has done something wrong, or if they’re done something that is confusing to you and you don’t understand why they’re doing it, you can send a request for information. These are related to, but a bit different than a notice of error under RESPA. Request for information is where you’re asking for information. This is where you can use a request for information. Maybe your mortgage company denied a loan modification and they say, “We did it because you did not provide your tax return,” and you know you provided your tax return. You sent them proof that you’d submitted your tax return. You’ve got the FedEx envelope, whatever it may be. Request for information would say, “Why did you refuse to process my loan modification, and why did you claim that I did not send you my tax information when I really did? Here’s the proof, the tracking number, here’s the green card from certified mail,” whatever it is. Here’s a couple of general rules for you. One request per letter. Make each letter simple. Separate out your requests so that the mortgage company has no excuse. If you send them a whole bunch of things all on one letter, mortgage company may say, “We got really confused because he asked us for 10 different things.” Which is a bogus reason, but they will make this excuse. Just send them one request per letter, so every letter stands on its own. You must send your letters to the correct address for the letters to work. The mortgage statement will tell you (usually it’s on the back side) that if you’re sending a notice of error, qualified written request or a request for information, use this address. The mortgage company website should also tell you. You can call your mortgage company to find out the correct address. If they don’t give you a special address, you can send it to the normal address, but typically they have a special address. We even have the mortgage companies argue this when we have the green cards back from certified mail. They say, “We didn’t sign for it,” (when we have their signature) so you can imagine what they do if it just comes with a first class stamp on the envelope. You could also do it overnight, you could do it FedEx. Bottom line, you have to be able to prove what you sent and that it was received. What does the mortgage company have to do when they get a request for information? This is also true of a notice of error. You want to keep a signed copy of whatever you send, so that you have proof of not only delivery, but what it is that you sent to them. Again, you have some protection built in, because you sent it by certified mail. 30 business days after they receive your request for information, they have to respond to it. If you ask for documents, they have to give you the documents. You ask for information, they have to give you the information, unless it’s an improper request. If it’s an improper request, they don’t have to give it to you, but they need to tell you why they believe it’s improper. It’s probably something you’re entitled to if it’s at all related to servicing. Your loan, how much do you owe on it, payments received, loss mitigation, things like loan modification, maybe having to do with your insurance, or your escrow. All that sort of stuff, you can ask legitimate questions, for documents, and information. You can get actual damages. Compensatory damages, this includes mental anguish damages. You can get statutory damages, that can be $2,000 per violation. We have some of these where we have sent out a total of maybe 30 or 40 letters, usually that’s in several waves of letter. We send letters and they refuse to respond, so we send another set of letters, “Why did you refuse to respond to my previous version of this letter?” Maybe there’s new things that they’ve done. You start stacking up those damages. If they fail to acknowledge, that’s a violation. If they fail to respond, that’s a violation. It’s a very powerful tool to get their attention, because they may be responsible for a lot of damages to you by refusing to respond to your letters. They could also be required to pay your attorneys their fees. If you sue in a federal court, obviously the mortgage company has to pay its own lawyers, but then if you’re successful, they may have to pay your lawyers, and that may be, for example, our rate at this time is $400 an hour. That’s what the smart ones do when they’ve been caught violating the law. There are some that are not so smart, and they want to just fight and fight and fight. They can pay the price for that when they do that. Keep in mind there are other laws that can apply. Remember under RESPA there are notices of errors. The Fair Debt Collection Practices Act, FDCPA, the Fair Credit Reporting Act, FCRA, those laws may apply as well, you may have state laws that apply. While not the only tool, RESPA is a very powerful tool. Request for information’s a very powerful part of RESPA, but you also have to look at other laws that may apply to you. If you have questions about this, feel free to give us a call. If you live in Alabama, it’s 205-879-2447, or you can contact us by filling out this form. If you have just general comments on this video, feel free to put those below. Please share your comments with us, especially if you liked this article. Even if you disagree. We appreciate any comments that we receive and we try to go through and respond to those as quickly as we can. If you want to share this, Twitter, Facebook, that’s wonderful. If you have ideas or questions about other videos, please feel free to let us know. That’s where we get the ideas for these videos, is from you. Look forward to hearing from you, and I appreciate you watching this video, and I will talk to you soon. Thank you. I’ll try to just give you the highlights. Our second mortgage, BBVA Compass, has set a sale date in October to foreclose. Starting April 10, we pursued a modification. Most of the time I did not know where we were at in the process. At one point they said they had denied our request because of incompleteness. Then they requested additional information. Then they said they had everything they needed to turn over to the underwriters. Then the underwriters requested more information. Then on May 19 they said everything was complete and they would have an answer by June 19. Then May 24 I receive a letter from a BBVA Compass attorney stating that we were in foreclosure. I responded to him on June 17 informing him we were in the modification process and I requested verification of the amount of the debt. More back and forth with the attorney, but never did receive verification. Then I received loan modification papers on July 30 from BBVA Compass. It was postmarked Saturday, July 28. The letter was dated July 13. It said, “To accept one of the loss mitigation offers provided, you must sign and return the inserted documents for the option you wish to accept within 15 days of the date of this letter.” The letter provided me with ONE loss mitigation offer, not multiple options. Also, coincidentally the postmark and the execution deadline were the same date. The modificaction they offered kept the same interest rate, shortened the term of payback and more than doubled my monthly payment. I appealed August 16. Three days after I postmarked my appeal letter, they inform me by phone my appeal was denied. Then I receive a denial of appeal letter through their attorney dated August 21. On August 30, I requested the amount to bring my loan current. I received no response to my request, however on September 15, I received a letter from their attorney giving me a sale date for foreclosure. It was set for October 19. On September 18 they give me the amount to bring my loan current including attorney fees. Why am I paying attorney fees? This whole time I have had to communicate through their attorney to know what is going on because I am not getting any mail through the US Postal Service from them and very few emails from them. A long time ago I gave up calling, because they never returned their phone calls. I do not know if they are violating any of my rights. I thought modifications were set up to help during hardship. A modification offer of more than double the monthly payment does not fit the definition of why modifications are done. Can you be of assistance? I can only imagine how frustrating this is — I have had many clients in the same boat as you and it is maddening. So sorry you are dealing with this. Couple of thought/questions for you. You don’t have to answer these here but get with a lawyer (us if in Alabama) ASAP. First, are you in Alabama or another state? I’m going to assume Alabama but if you are in another state the laws can be much different. So get with a lawyer in your state. If you are in Alabama, I suggest calling us immediately at 205-879-2447 and asking for Randi. Second, what was the basis of the denial of the appeal? Third, what does your mortgage say about foreclosure? I’m talking about your mortgage with Compass. Normally it is paragraph 22 that talks about foreclosures and default letters. Fifth, do you want to keep your home? Do you have equity in it (i.e. it is worth more than you owe in total)? Sixth, is everything good with your first mortgage? Seventh, have you kept copies of all letters to and from the mortgage company and foreclosure attorneys? Including the envelopes showing the games they are playing with postmarking letters many days after the date written on it (a favorite dirty trick of mortgage companies). Eighth, I don’t know when your foreclosure sale is scheduled in October but time is short. So I would think very strongly about suing before the foreclosure so a judge looks at this instead of trusting the mortgage company to do the right thing. This can be combined with using RESPA letters also. Bottom line is you need to act quickly. You have been most generous with this mortgage company and they have played games with you. Now is the time to take immediate massive action to stop the foreclosure. If outside of Alabama get with a great foreclosure defense attorney in your state — if in Alabama call us at 205-879-2447. We represent folks all over Alabama. Ask for Randi and we’ll get started with you right away helping you figure out your options.